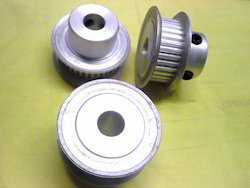 Made available in the market at the most reasonable rate possible, the offered range of Timing Pulley is widely asked for. Known to have a superior sturdiness, dimensional accuracy and durability, the offered range is manufactured in compliance with the set industry norms and guidelines. Further, the offered range is manufactured in compliance with the set industry norms, for quality maintenance.